"All About Millennials: Recruiting and Retaining Millenials"
Recruiting and retaining millenials has become challenging for the companies today. Many avenues are available for organizations to increase their awareness of Millennials’ needs. Millenials: Who are they and why should employers care about them? Millenials are the young individuals who possess unique characteristics that can strengthen workforces and bring new insight to organizations. Companies working with Millenials will find themselves with a productive workforce and the opportunities to develop the next generation of leaders. Recruiting strategies for Millennials:How to attract and keep top Millennial talent to your business? Retaining Millennials in the workplace:What are some suggestions for retaining the best of the Millennial generation? How Millennials are disrupting the workforce — for the better? What are the steps taken by the leading companies to ensure Millennials maximize their productivity? 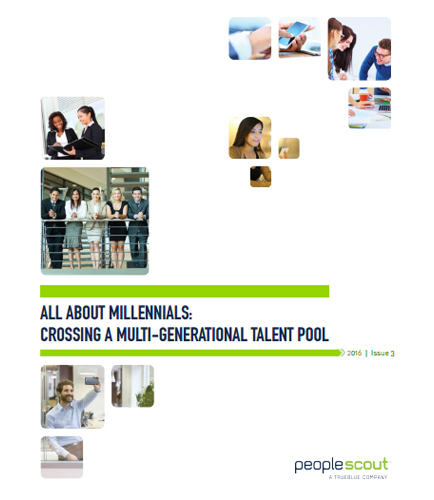 Download this whitepaper to know more about the keys to grow and succeeding in an increasingly competitive global marketplace by recruiting and retaining millenials. In order to effectively measure employee engagement, you need to analyze your current employee data to ensure in-depth results? Are you asking the right questions? Is your survey date optimal for employee participation? Your organization’s engagement won’t improve if you don’t do something about it. It’s time to take action. Gather employee feedback, analyze in-depth results, and make work awesome!Read this whitepaper to know more.. Inside this whitepaper : WHO DO I SURVEY FOR THE MOST EFFECTIVE FEEDBACK? HOW DO I SET UP EMPLOYEE DATA? WHAT QUESTIONS ACCURATELY MEASURE ENGAGEMENT? WHEN IS THE BEST TIME TO SURVEY? WHO SHOULD CONDUCT MY SURVEY? This white paper makes the case for the “Total Recognition” solution–a more balanced and complete implementation philosophy that from day one will afford a comprehensive answer to enterprise recognition. It examines the contemporary role of some of the more common recognition concepts including service awards, above and beyond initiatives, peer-to-peer programs and President’s Awards, and outline how they work to motivate certain employee audiences. It highlights where those schemes are effective and also point out why those components alone fall short in their quest to appreciate, inspire and honor every employee’s contribution at key moments. What is Human Resource Management ? "The Human resource management or HRM of a company is the management of human resources which maintains and enhances the organization’s human resources by planning, implementing, and evaluating employee relations and assessment of HRM policies, programs, and practices."